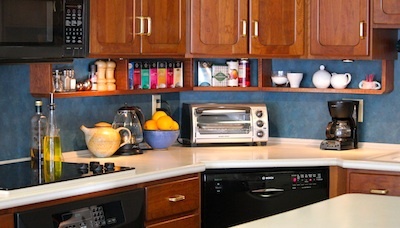 There have been a lot of posts recently in the design blogs about finding extra storage in your kitchen. 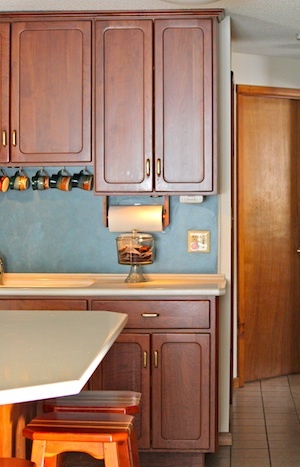 I occasionally wonder about cabinet designers not being able to think outside the box. 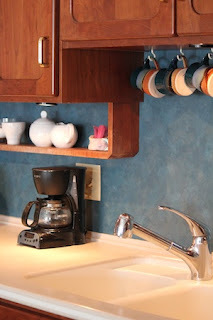 When I had my kitchen redone years ago I requested that small under- cabinet shelves be added. They thought I was crazy but added them. They are a great kitchen storage solution. My shelves are just 6.5 inches high and 4.5 inches deep and they hold so much. I keep things I need easy access to in this often under-used space - salt and pepper shakers, sugar and creamer, assorted teas. Although these were made and installed along with the cabinets, one could easily make open-backed boxes out of 1x6 pine or laminate board and screw them to the bottom of existing cabinets. I had them installed under nearly all my cabinets. I did have to select my coffee pot carefully to be sure it fit underneath. The shelves are also a great place for displaying collectibles. Below is a set of handcrafted pottery mugs designed to look like bent tin cans. I also had a paper towel holder crafted in the same style and installed next to the sink. 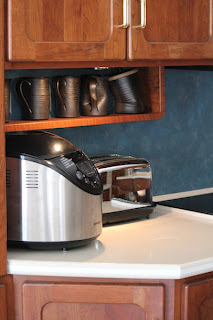 There is no doubt about it - this design is a very handy kitchen storage solution. I have been thinking about this very solution for some time now. 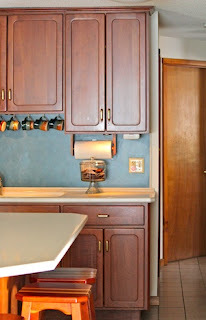 We are in the process of refinishing our cabinets, and I think I'll ask my husband to add something like this too. This solution has continued to be an effective kitchen storage space. I have changed what I s tore there but have always used it. It has done wonders in helping with kitchen clutter.